The Chevron GR8 smashes against the Donington Park barriers - And Jordan Witt walked away! Chevron Racing Cars rising star racer, Jordan Witt, 20, survived a massive 110mph, 30g crash in his Chevron GR8 GT at the infamous Redgate corner at Donington Park this weekend – but, thankfully, walked away unscathed, proving what a safe and strong car the compact GR8 race car is, even in such a high speed racing incident. The weekend was going perfectly for Chevron and youth race sensation Jordan Witt (www.jordanwitt.com) – with the diminutive, heritage-rich GR8 GT qualifying for its first pole position in the GT Cup, in dry conditions, despite the extra 60kg of ballast the car was carrying from its Brands Hatch win last time out, again beating the Ferrari 430’s, Porsche GT3’s and other supercars. 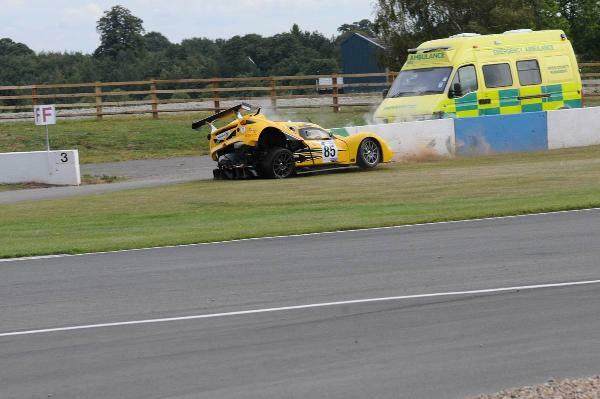 Then, at the start of the first race, disaster struck, through no fault of his own, in an incident involving a Ferrari 430 driven by ‘Secret Millionaire’ star, Gary Eastwood at the challenging turn one, Redgate. 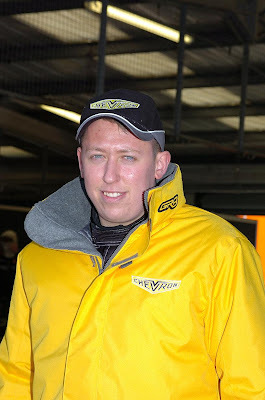 Gary Eastwood was black flagged by the Clerk of the Course instantly, and after three laps, eventually came into the pits and was removed from the race. His race licence was later endorsed. “We are focusing now on re-building the GR8 for the next round at Rockingham, just a few days away, and hope to continue our run of success with the new, exciting GR8 race car – which is getting some great results against established names and racers. Jordan is a superb driver and we are very confident the Chevron GR8 will continue its run of success, just a few months since we launched the new race car,” Helen added. Chevron Racing Cars made a stunning race debut in the GT Cup Championship (www.gtcup.co.uk) in August – with an inaugural victory in the ballistic Chevron GR8 GT at Brands Hatch Indy Circuit. Jordan Witt, took a huge victory – by over 11 seconds – in the second of two sprint races in the Chevron GR8 GT Car, blitzing Ferrari 430’s and Porsche 911 GT3 racers to take the chequred flag in style, in the pouring rain. The GT Cup Championship Sprint (25 minutes) and GT Trophy Endurance Series races are designed for GT Cars with both up-and-coming racers, like Jordan, and “gentleman drivers,” like his father, David Witt – who was racing alongside his son at Brands Hatch in the Chevron Challenge Car in August, and again at Donington Park. The Challenge Car runs mainly the same high specification as Jordan’s Chevron GR8 GT Car, with a re-worked version of the GT version’s full aero pack. Unbelievably given his pace and success already, Jordan Witt has only been racing competitively for twelve months, in the Dunlop Sport MAXX Cup, Chevron GR8 Challenge and in the epic British GT Championship, in the Chevron GR8 GT. And, as well as his recent crash at Donington, the Cheshire race ace has also just recovered from a dose of the mumps and a serious bout of conjunctivitis prior to the Brands Hatch GT Cup races. But that didn’t stop him taking the c260 bhp, 750Kg Chevron GR8 GT to a historic inaugural victory in the second of the two sprint races, and getting pole position at Donington Park before the crash. The future is bright for young Witt, and the Chevron GR8.